Do Extraordinary Events Require Extraordinary Evidence? The Christian position only asks that we use the same reasoning and rational thought that we use to derive what are considered good conclusions in historical investigation, and apply those same means and methods to the New Testament and the resurrection of Jesus. Why step 2,000 years into history to put our faith in an event that violates the laws of science? Why insist that the resurrection is anything more than a myth? After all, isn't DEAD MAN COMES ALIVE the kind of headline we usually expect to find on those tabloids that litter the supermarket checkout lanes? Can educated, refined people living on the threshold of the 21st century be convinced that Jesus really did come back from the dead? So much depends on the answer to this question. The reliability of the Bible. The answer to your search for meaning. The destiny of all people. It all depends on whether or not Jesus is alive. Did His body ever leave the grave? Has the Family Tomb of Jesus Been Found? "All that Christianity asks of men is, that they would be consistent with themselves; that they would treat its evidences as they would treat the evidence of other things; and that they would try and judge its actors and witnesses, as they deal with their fellow men, when testifying to human affairs and actions, in human tribunals. Let the witnesses be compared with themselves, with each other, and with surrounding facts and circumstances; and let their testimony be sifted, as if it were given in a court of justice, on the side of the adverse party, the witness being subjected to rigorous cross-examination. The result, it is confidently believed, will be an undoubting conviction of their integrity, ability, and truth." Dr. Simon Greenleaf, Royal Professor of Law at Harvard University. "Are these men, who helped transform the moral structure of society, consummate liars or deluded madmen? These alternatives are harder to believe than the fact of the Resurrection, and there is no shred of evidence to support them." Dr. Paul Little. "The silence of Christ's enemies 'is as eloquent a proof of the Resurrection as the apostles' witnesses." Dr. John R. W. Stott. "In 56 A.D. Paul wrote that over 500 people had seen the risen Jesus and that most of them were still alive (1 Corinthians 15:6 ff.). It passes the bounds of credibility that the early Christians could have manufactured such a tale and then preached it among those who might easily have refuted it simply by producing the body of Jesus." Dr. John Warwick Montgomery. "In all the fragments and echoes of this far-off controversy which have come down to us we are nowhere told that any responsible person asserted that the body of Jesus was still in the tomb. We are only given reasons why it was not there. Running all through these ancient documents is the persistent assumption that the tomb of Christ was vacant. Can we fly in the face of this cumulative and mutually corroborative evidence? Personally, I do not think we can. The sequence of coincidences is too strong." Dr. Frank Morison. 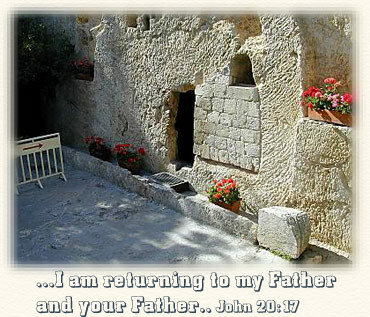 "The empty tomb stands, a veritable rock, as an essential element in the evidence for the resurrection. To suggest that it was not in fact empty at all, as some have done, seems to me ridiculous. It is a matter of history that the apostles from the very beginning made many converts in Jerusalem, hostile as it was, by proclaiming the glad news that Christ had risen from the grave--and they did it within a short walk from the sepulchre [grave]. Any one of their hearers could have visited the tomb and come back again between lunch and whatever may have been the equivalent of afternoon tea. Is it conceivable, then, that the apostles would have had this success if the body of the one they proclaimed as risen Lord was all the time decomposing in Joseph's tomb? Would a great company of the priests and many hard headed Pharisees have been impressed with the proclamation of a resurrection which was in fact no resurrection as all, but a mere message of spiritual survival couched in the misleading terms of a literal rising from the grave?" Dr. J. N. D. Anderson, Lawyer and Professor of Oriental Law at the University of London. "When therefore the disciples began to preach the resurrection in Jerusalem and people responded, and when religious authorities stood helplessly by, the tomb must have been empty. The simple fact that the Christian fellowship, founded on belief in Jesus' resurrection, came into existence and flourished in the very city where he was executed and buried is powerful evidence for the historicity of the empty tomb." Dr. William Lane Craig. "The disciples had nothing to gain by lying and starting a new religion. They faced hardship, ridicule, hostility, and martyr's deaths. In light of this, they would have never sustained such unwavering motivation if they knew what they were preaching was a lie. The disciples were not fools and Paul was a cool-headed intellectual of the first rank. There would have been several opportunities over three to four decades of ministry to reconsider and renounce the lie." Dr. J. P. Moreland. "[that belief in the resurrection] was the belief that turned heartbroken followers of a crucified rabbi into the courageous witnesses and martyrs of the early church. This was the one belief that separated the followers of Jesus from the Jews and turned them into the community of the resurrection. You could imprison them, flog them, kill them, but you could not make them deny their conviction that "on the third day He rose again." Dr. Michael Green, former principal of St. John's College, Nottingham. "This scared, frightened band of the apostles, which was just about to throw away everything in order to flee in despair to Galilee; when these peasants, shepherds, and fisherman, who betrayed and denied their master and then failed him miserably, suddenly could be changed overnight into a confident mission society, convinced of salvation and able to work with much more success after Easter than before Easter, then no vision or hallucination is sufficient to explain such a revolutionary transformation." Jewish Rabbi Pinchas Lapide. "I have been used for many years to study the histories of other times, and to examine and weigh the evidence of those who have written about them, and I know of no one fact in the history of mankind which is proved by better and fuller evidence of every sort, to the understanding of a fair inquirer, than the great sign which God hath given us that Christ died and rose again from the dead." Professor Thomas Arnold, author of a famous three-volume History of Rome, appointed to the chair of Modern History at Oxford. "The claims of Jesus Christ, namely his resurrection, has led me as often as I have tried to examine the evidence to believe it as a fact beyond dispute." Lord Caldecote, former Lord Chief Justice of England. "The fact that Christ rose from the dead on the third day in full continuity of body and soul - that fact seems as secure as historical evidence can make it." Professor Edwin Gordon Selwyn.